spaCy is a Python framework that can do many Natural Language Processing (NLP) tasks. Named Entity Extraction (NER) is one of them, along with text classification, part-of-speech tagging, and others. 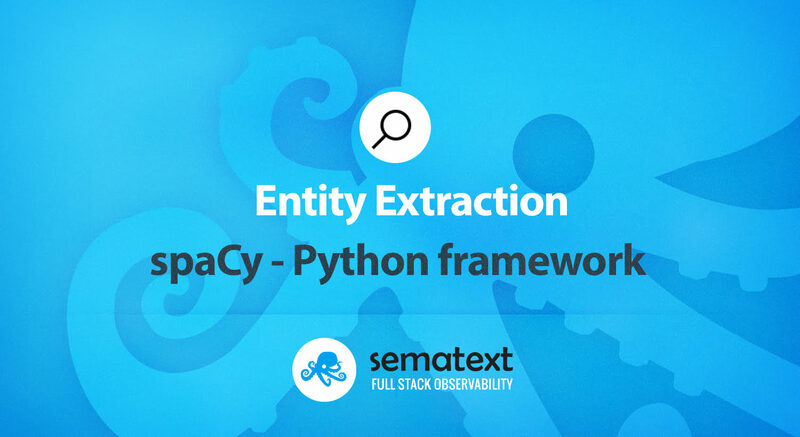 If this sounds familiar, that may be because we previously wrote about a different Python framework that can help us with entity extraction: Scikit-learn. Though Scikit-learn is more a collection of machine learning tools, rather than an NLP framework. spaCy is closer, in terms of functionality, to OpenNLP. We used all three for entity extraction during our Activate 2018 presentation. In this post, we’ll use a pre-built model to extract entities, then we’ll build our own model. For this particular example, this result is “approximate” at best. 2016 is indeed a date, but #bbuzz isn’t money. And I doubt that Rafał was Running High while giving that presentation. For this use-case, we’d need to build our own model. To train a new model, we first need to create a pipeline that defines how we process data. In this case, we want to extract entities. Then, we’ll train a model by running test data through this pipeline. Once the model is trained, we can use it to extract entities from new data as well. Let’s zoom into each step. With spaCy you can do much more than just entity extraction. For example, before extracting entities, you may need to pre-process text, for example via stemming. Or we may want to do part-of-speech tagging: is this word a verb or a noun? And that’s it! Now we have a model built for our own use-case. Like in the OpenNLP example we showed before, spaCy comes with pre-built models and makes it easy to build your own. It also comes with a command-line training tool. That said, it’s less configurable – or at least you don’t have all the options as accessible as in a purpose-built tool, like Scikit-learn. For entity extraction, spaCy will use a Convolutional Neural Network, but you can plug in your own model if you need to.